Travellers on the main road north have seen little of Tain since it was by-passed by the A9 in the 1980s. But it is worth the slight detour to take a look at what this town with its surprisingly grand collection of sandy coloured stone buildings has to offer. Tain may have been founded as a Viking settlement. The name probably has its origins in Thing, a Norse name signifying this as the site of a council or parliament. Tain's history is intertwined with the story of St Duthac, born here in about 1000. He died in Ireland, but his remains were returned to Tain and buried in the original St Duthac's Chapel, said to be built on the site of his birth. 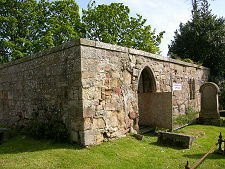 Its ruins lies on the north east side of the town, in the old town cemetery and near the golf club. This first chapel rapidly became a place of pilgrimage and of sanctuary, though the latter was marked more in its breach than in its adherence. Robert the Bruce's family took shelter here en route to Orkney during his exile. But the Earl of Ross took them prisoner anyway, and handed them over to a grisly fate at the hands of the English in 1307. This idea of sanctuary also led to the chapel's demise, in 1427. A local outlaw had pursued an enemy into the chapel, and overcame the technicality of sanctuary by burning it down. 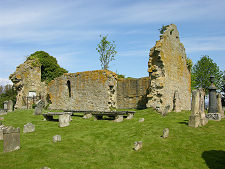 St Duthac's relics were then transferred to St Duthac's Collegiate Church, in the centre of Tain. This had been built in 1360 on the site of an earlier church, part of which still remains in the churchyard. The Collegiate Church then also became the focus of pilgrimage, and in the years around 1500, King James IV visited every year for 20 years. Accounts differ about whether this was as a result of religious fervour: or whether it was because he had conveniently located his mistress close to the route north. St Duthac's remains disappeared during the chaos of the Reformation in 1560. Today it is still possible to visit the original chapel, now within a graveyard overlooking the sea. St Duthac's Church in the centre of Tain now forms part of the highly acclaimed Tain Through Time exhibition, which is also housed in other buildings around the churchyard. The centre of Tain is dominated by the massive and imposing tower of its tolbooth. This was first built in 1630 to house court offices and a jail, and to collect tolls and taxes from traders. However in 1656 Cromwell's troops were quartered in Tain, damaging large parts of it and causing most of the resident population to flee. In the 1690s much of Tain remained in ruin, and worse was to follow when first famine and then fire swept through what remained in 1696-7. Funds for remedial work were collected far and wide, and in 1706 work began on the replacement tolbooth you see today. This was largely complete by 1708, though the tower was not finished until 1733. The bell is from the original tolbooth, being cast for the building in Flanders in 1630. 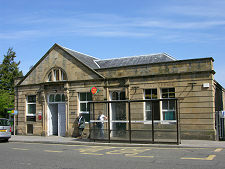 In later years Tain's tolbooth was used as an administrative centre during the clearances. 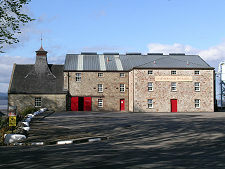 Just north west of Tain is another of its major attractions, the Glenmorangie Distillery. Visit our separate feature page to find out more about it.